Meanwhile, in small saucepan, melt butter over medium heat. Stir in flour with whisk; cook 1 to 2 minutes, stirring constantly, until mixture is bubbly. Gradually stir in milk; cook 3 to 5 minutes, stirring constantly with whisk, until sauce is thickened and smooth. Remove from heat. Stir in paprika. Season with salt and pepper. Stir in chopped hard-cooked eggs. Split warm biscuits in half; place 2 halves on each of 4 serving plates. 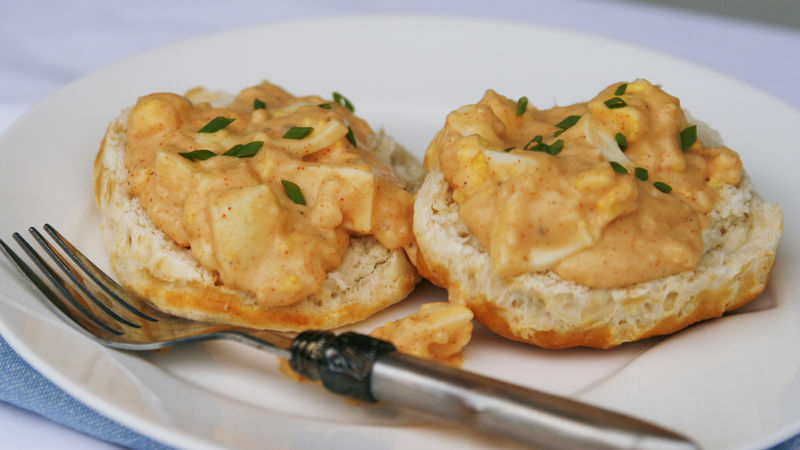 Spoon egg sauce evenly over biscuits. Sprinkle with chives. Serve immediately. This recipe is a great way to use leftover hard-cooked eggs, but if you don’t have any on hand, you can purchase hard-cooked eggs in the dairy case at many grocery stores. You can make this dish even more indulgent with a sprinkle of crumbled cooked bacon. Substitute freshly grated Parmesan cheese for the chives, if desired.